In Indonesia, Anger Against Mining Giant Grows Workers at the world's largest gold mine, located in Indonesia's remote Papua province, have gone on strike for higher pay; several people have died in clashes with police. Critics say the mine's owner, American mining conglomerate Freeport-McMoRan, operates with impunity because of powerful friends. Police clash with workers of American mining company Freeport-McMoRan during a protest in Timika, Papua province, Indonesia, Oct. 10. 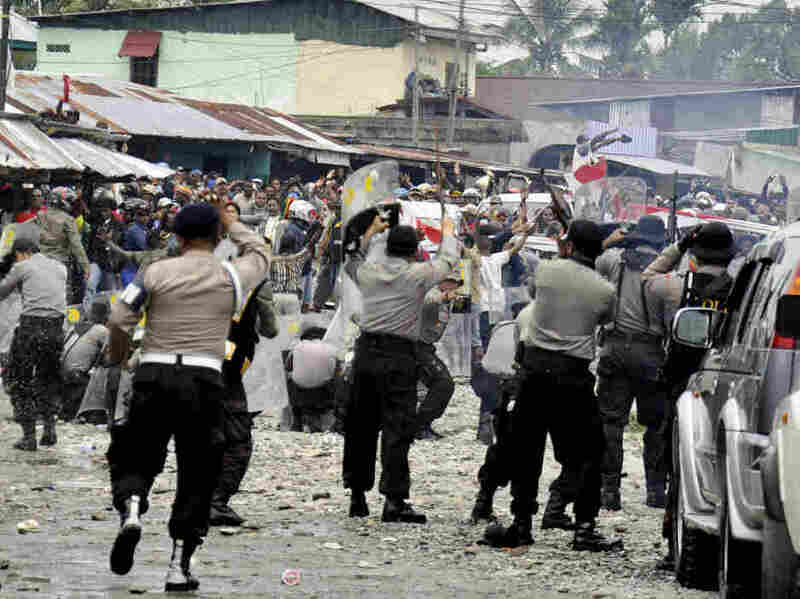 Indonesian security forces fired on striking workers at Freeport-McMoRan's Grasberg gold and copper mine after a protest turned deadly. The Grasberg mine's open pit yawns near equatorial glaciers in the shadow of Mount Puncak Jaya in Papua. In recent weeks, thousands of miners there have gone on strike for higher pay; several have been killed. On Oct. 10, miners tried to block replacement workers from boarding buses to the mine. Some strikers threw rocks at police, who answered with gunfire, killing miner Petrus Ayamiseba and wounding six others. Then on Oct. 15 and again on Oct. 21, unidentified gunmen struck, killing four Freeport-McMoRan workers and two locals. Meanwhile, unidentified saboteurs cut the pipeline that carries minerals from the mine down the mountain and to a local port. The violence is the latest chapter in problems that have dogged Freeport-McMoRan since it signed its first contract with the Indonesian government in 1967. It was not until two years later that Indonesia's government annexed the region. The Freeport-McMoRan issue complicates Jakarta's governance of the country's newest, poorest and remotest province, wracked by a low-level insurgency waged by Papuans seeking independence. On Sept. 15, thousands of unionized workers walked off the job. Union lawyer Tri Puspital says the workers are seeking wages of $7.50 to $33 an hour. "We're making $1-$3 an hour," he explains. "We're not asking for the same pay as Freeport workers in other countries. We are just asking for what's rightfully ours, considering how much the minerals mined at Grasberg contribute to Freeport." The miners point out that last year, the Grasberg mine contributed $6.3 billion of the nearly $19 billion in revenues reported by Freeport-McMoRan Copper & Gold. The company, based in Phoenix, Ariz., is the world's largest producer of copper and gold, and ranks 136th on the Fortune 500 list, just behind Nike and ahead of Time Warner Cable. Freeport-McMoRan is offering the miners a 30 percent wage increase. It points out that it pays Indonesia billions of dollars in taxes, and has helped to build roads, schools and hospitals. Yet critics accuse Freeport-McMoRan of destroying Papua's environment and of complicity in decades of human rights abuses by the Indonesian armed forces. "What has happened to the Papuans, if people could see and if people understood, would break your heart," says Australian academic Denise Leith, who wrote The Politics of Power, a book about Freeport-McMoRan. "Freeport are indeed part of that, because of their support of the Indonesian military." Tribesmen carrying bows and arrows block a road in Timika to support striking workers from the Freeport-McMoRan mine on Nov. 4. Foreign media are barred from Papua without government approval. Freeport-McMoRan spokesman Eric Kinneberg declined to be interviewed for this story. But in an email to NPR, he wrote that under the terms of an Indonesian presidential decree, Freeport-McMoRan gave the police and military $14 million last year for support services and community programs. Andreas Harsono, a Jakarta-based researcher with the group Human Rights Watch, notes that the legality of the payments has never been challenged in court. "There are laws in the U.S. and also in Indonesia that U.S. companies, and Indonesian companies, any company, cannot pay the Indonesian military," Harsono explains. "But it can be waived if the company is considered to be on the list of vital national interests." Freeport-McMoRan denies paying individual policemen or soldiers. But The Jakarta Globe newspaper recently quoted National Police Chief Timur Pradopo, who defended the direct payments as legitimate. He called them "lunch money." The police have agreed to allow the country's chief anti-graft watchdog, the Corruption Eradication Commission, to investigate the payments. In a letter dated Nov. 1, 2011, the United Steelworkers union wrote to the U.S. Department of Justice, asking it to investigate whether Freeport-McMoRan's payments amounted to bribing a foreign government, in violation of the U.S. Foreign Corrupt Practices Act. 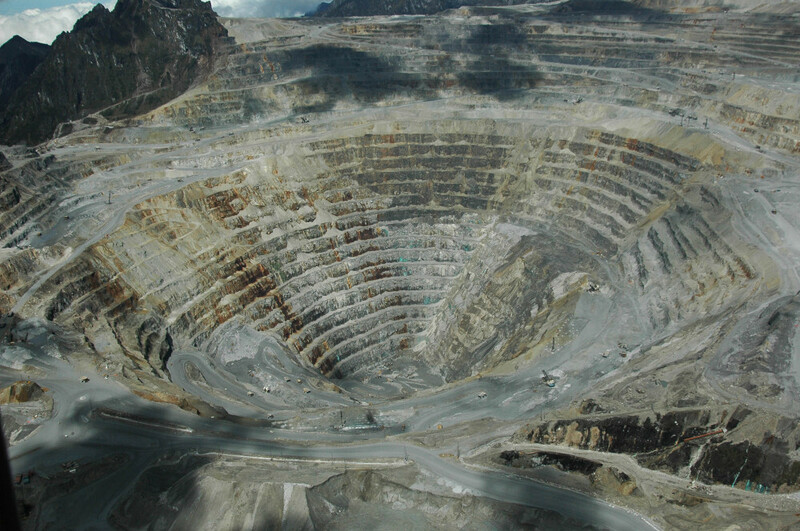 Critics accuse Freeport-McMoRan not only of underpaying workers but also of destroying the environment in remote Papua and of decades of complicity in human rights abuses by the Indonesian military. Here, an aerial photograph of the Grasberg mining complex. In 2003, the U.S. Securities and Exchange Commission considered similar allegations, but it sided with Freeport-McMoRan. Leith is exasperated that none of the charges against the conglomerate have stuck. "I don't know what more anyone can do," Leith says. "If the government is not going to hold them accountable, the SEC will not hold them accountable, and the shareholders will not hold them accountable, who does?" Abigail Abrash Walton, a human rights expert at Antioch University New England in Keene, N.H., says Freeport has lobbied its way out of some tight spots with the help of powerful board members, including former U.S. Secretary of State Henry Kissinger. "Because of politics and the power of money in politics, this company has been able to avoid accountability under the rule of law," Walton says. Walton notes that in 2000, Indonesia's then-President Abdurrahman Wahid suggested that the government should renegotiate its contract with Freeport-McMoRan, which has a 91 percent stake in the venture, to give the country a bigger share of the profits. When Wahid "made that noise," Walton says, Kissinger flew to Jakarta immediately, met with the president and offered himself as an adviser to the new government. "And as soon as he did that, the issue about renegotiating the contract with Freeport went away immediately," Walton says. The Papuan people, who are most directly affected by Freeport-McMoRan, are divided about the issue. Some have profited handsomely from it. Others, like activist Dorus Wakum, see it as a disaster for the indigenous people. "We always ask the God, 'Why you give this mountain gold for our people in Papua land?' " Wakum says. "This company, all the people in the world coming to here to took our gold and then bring the army, bring the police to kill our people." Wakum bitterly accuses the Indonesian government of being interested in Papua's natural resources, not its people. He says Papuans must have the right of self-determination, and he believes the U.S. has a responsibility to at least start paying attention. "I ask president of America, Mr. Obama, must help, must understand," he says. "Because you have took our gold, our rich natural resource, you make your country rich, but our people poor." 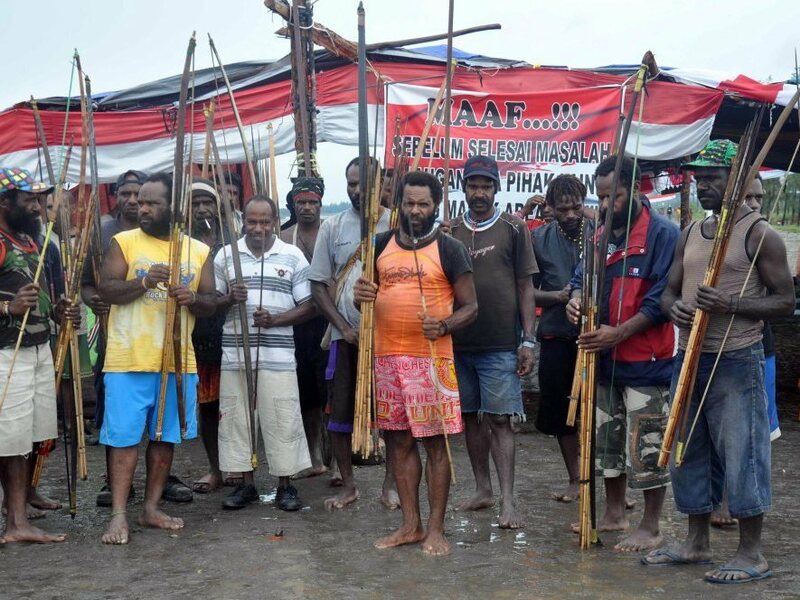 After weeks of deadlocked talks between the labor union and Freeport-McMoRan, police in Papua have threatened to break the strike if the union doesn't call it off.